This delicious frozen treat consists of raspberries, mangos, strawberries, melons topped with condensed milk and strawberry syrup all on a bed of crushed frozen ice. 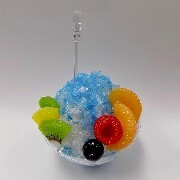 To give this dessert an all-around flavor, it has been garnished with a heart-shaped frozen piece of ice and pocky to complete the masterpiece. *Dish pictured may differ from actual dish shipped.